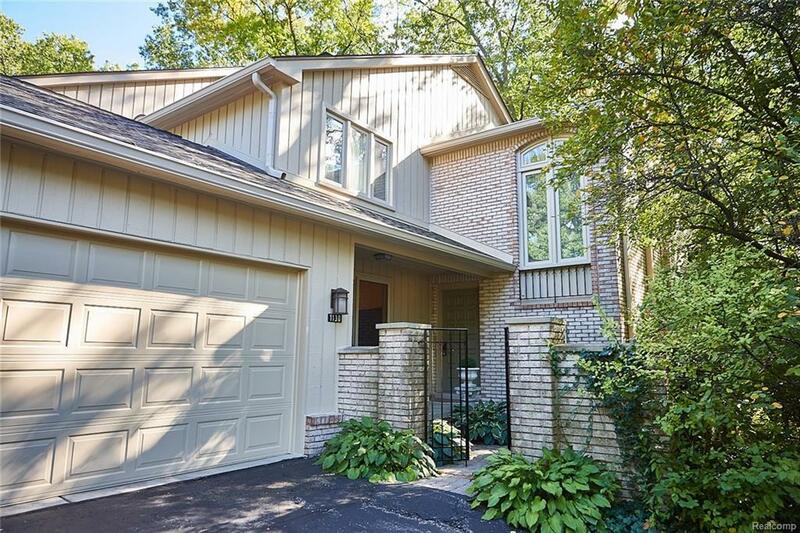 EXCELLENT LOCATION AT THE END OF THE CUL-DE-SAC, THIS END-UNIT TOWNHOUSE IS SURROUNDED BY THE PRIVACY NATURE HAS TO OFFER. BEAUTIFUL GATED COURT-YARD ENTRY WITH BRICK PAVERS, WATER FOUNTAIN INCLUDED. COVERED PORCH TO FOYER WITH CERAMIC TILE INTO POWDER, KITCHEN AND FAMILY ROOM. KITCHEN WITH CORIAN COUNTERS, LIVING ROOM WITH DEEP CROWN MOLDINGS, NATURAL FIREPLACE WITH GAS LOGS. ONE OF THE FEW CONDOS WITH DIRECT ACCESS FROM HEATED GARAGE TO THE CONDO. ALL NEWER WINDOWS AND DOORWALLS (2010 THRU 2015) WITH EXTENDED WARRANTY. MAINTENANCE-FREE TREX DECK WITH SEATING IN 2015. ASSOCIATION FEE INCLUDES BLDG MAINTENANCE, BLDG INSURANCE, WATER, USE OF CLUBHOUSE WITH POOL AND TENNIS, ACCESS TO NATURE TRAIL, SNOW REMOVAL & SALT. BLOOMFIELD SCHOOL DISTRICT.